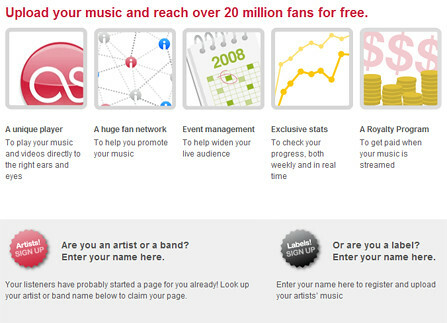 Social music site Last.fm has launched what it describes as the world’s biggest free music service. It is promising to pay unsigned artists royalties every time a user streams a track to their computer. The website has done deals with the four major record companies as well as more than 150,000 independent labels to offer access to their catalogues. Users will be able to listen to any track – streamed rather than downloaded – up to three times. After that period Last.fm members will be encouraged to buy the track via links to iTunes and Amazon and other download services. A share of any resulting sales, coupled with advertising, will fund the service. Asked whether users would not prefer to own music – and be able to put it on a portable player – rather than just being able to stream it, he said: “The way people consume music is changing – sometimes you just want to listen to it there and then.” Unsigned artists who use the scheme will get a payment from Last.fm every time someone listens to one of their tracks. This is just the latest attempt to find a new model for an industry struggling with falling physical sales, while attempting to earn money from online music. Last year saw the launch of Spiral Frog, another free service supported by advertising. Unlike Last.fm, it offers free downloads but has failed to make a major impact. Mr Jones from Last.fm said that may be because users are forced to listen to an advert with each track, whereas his service will be supported by banner advertising. Last.fm is launching its on-demand service in the US, UK and Germany immediately, and plans to roll it out globally over the coming months. The big record labels will be watching closely to see how great the demand is for streamed music – and how many of the customers then go on to pay for downloads.